So much of how we feel and the reality we create relate back to our thoughts. Up to 7% of our thoughts are repetitive ones, and they end up shaping our emotions and eventually much of our physiological state. In today’s episode, Hillary provides a visualization and meditation practice to connect with our future selves and to help us become aware of how our thoughts affect our emotions. This is especially important in fertility, where we often must believe in something that hasn’t happened yet, such as becoming a parent. [1:35] With more than one thought a second and 60,000 of them a day, it is completely normal for us to believe that our thoughts are the true reality. [2:55] Most of our thoughts that continue to cycle throughout our adult life begin in the ages of 5-15 years old. This is when we are most trying to figure out and navigate the world around us, with our brain trying to create connections and realities to keep us safe. [3:15] Your thoughts and beliefs create a vibration, a feeling, and emotion. They ultimately inform our nrevous system and tell us if we are in a threatening situation or one where there is safety and security. [8:25] Hillary defines stress as an experience of an unmet need or expectation. [9:42] A woman’s brain can make fertility issues just as bad as a chronic health condition. It is common in infertility issues for our brains to get stuck on a loop questioning if it will ever happen or why it hasn’t happened yet. Our brains are always looking for evidence from our past to shape what we believe. [10:43] By changing your thoughts you will change your outlook, emotions, and nervous system. [11:01] The brain is always looking for confirmation of our thoughts. [11:54] The exercise begins. This gives us the opportunity to see how fast you can change your stress response to a relaxation response and turn on our parasympathetic nervous system or what is known as breed and feed. This state not only enhances fertility but can also help hold a pregnancy, even if it is high risk. At my house we do the cliche thanksgiving thing of what are we all grateful for. and that what we are going to do today in our meditation, only we are going to explore gratitude in the 5 realms of our life as it relates to our fertility picture, because sometimes those answers are a little contrived, or a little PC, because your parents neighbors who you’ve never met are joining in the celebration and that’s just awkward sauce to say out loud to anyone but your partner. You might want a pen and piece of paper to jot things down after so you can keep them close or put them in your calendar as a reminder before important appointments. Todays relaxation response technique is technically called Autogenic Training. It’s a technique that is credited to Dr. Johannes Schultz and was popularized in the 90’s by Dr. Herbert Benson’s book - The Relaxation Response and has to do with the power of verbal suggestion. Now these verbal suggestions called orientations, can be thought of as a type of self hypnosis. This is different than an affirmation because we are going to take the verbal suggestions into the body to help it relax, not just repeat something in our minds. Once you’ve used this phrase though and effectively calmed your body down, you should be able to pull it out in a pinch and repeat it silently to yourself and have some of the same effect. It's perfect to use when your heart is racing before a doctors appointment or during the two week wait when you find yourself extra anxious. When you use autogenic training, you are essentially bypassing your conscious mind in order to instruct your body to relax via your subconscious mind. Autogenic Training sounds so formal and stuffy though- so I decided to rename it today to verbal suggestions so you can calm the frick down. Today's episode is brought to you by, Pregnancy Brain, by Parijat Deshpande. You can find it anywhere books are sold or at pregnancybrainbook.com. I have, guilty as charged. It happens, I get caught up in my to do lists or the occasional over extension of myself and I show up at one of my bi- monthly scheduled self care appointments and I’m suddenly aware that I am way more stressed than I thought. I see this happen all the time in my clinic with my fertility patients. I ask them if they have any pain or discomfort and they reply, I’m fine. Often times I will start with a technique of cupping to help relieve tension in the neck and back and as soon as I lay my hands on them, I can feel the knots. Sometimes I can see the tension in their necks, just by how they are holding themselves. So if this sounds like you, today’s exercise is going to help you get out of your head and into your body. It’s call PMR or progressive muscle relaxation. It’s great for people that live in their heads. It distracts them just long enough to reconnect with their precious body. Now if you have an acute or chronic pain you may want to skip that body or go lightly with it when we get there, as this technique involves tensing the muscle first and then relaxation. It’s kind of like tricking your muscles into relaxing, especially when you feel like you no longer know how to. So even if you’ve done this one before, do it with me. Sometimes its super nice to just let someone else guide you and really get you out of your head. How do you set the tone for mindfulness & actually practice it? Whether you are doing something prolific like making love, or something mundane like the dishes get in the habit of asking yourself these questions and then observing the answer you come up with, without judgment. Try it with me, wherever you are, whatever you are doing ask yourself these simple questions. Drop into the present moment and quit entertaining your past or your worries about the future. By taking the time to ask yourself these questions and thoughtfully responding, you allow yourself to me more fully engaged in the activity and deepen your experience. Even though it is a practice that is seemingly more mental than following the breath because we are entertaining your mind, it really allows you to drop out of your head and into your body. It allows you take a break from what’s going on in your head, which chances are is the same conversation with yourself on repeat, and I’m willing to bet it’s probably not saying anything you would repeat to someone outloud. So if you want to change the way you feel, you have to start paying attention to what is really happening in the moment and not what your repetitious thoughts would like you to believe. You just have to commit to doing it! Meditation is great, but what happens when you need to reset your nervous system during the day from Fight & Flight to Breed & Feed? Mini Mindful Moments are techniques for you to try out throughout your day to help you not only be more mindful and present, they will affect your nervous, immune, and endocrine systems biochemically in a positive way when practiced regularly. Enjoy! I suggest setting an alarm on your phone during your work day or after what you anticipate to be stressful events to help you get in the habit of creating a calmer you! Try it and see for yourself and remember what calm, cool, and confident you feels like. Board-certified hypnotherapist and award-winning author Lynsi Eastburn joins us today to share her experience from over 25 years in the mind-body healing arts. Lynsi is a true pioneer of bringing hypnosis to the treatment of infertility, and we had such a fabulous talk about how belief systems can become a block when trying to fall pregnant, how she was led to her calling, the creation of HypnoFertility®, and how hypnosis can help us switch from fear and doubt into observation and peace. [0:32] Our guest today is Lynsi Eastburn. Lynsi is a board-certified hypnotherapist and certified hypnotherapy instructor through the National Guild of Hypnotists, along with running the Eastburn Hypnotherapy Center and Eastburn Institute of Hypnosis with her husband Drake. Lynsi is an award-winning author, with one more book in the works entitled Waiting in the Wings, the Pink Starlights. [8:03] Lynsi said yes to the whispers that were stirring in her at a young age of having an interest in helping women have babies and bringing sensitivity and compassion to those having fertility issues. [13:54] Lynsi’s book, It’s Conceivable is the art and science of hypnotherapy — how it deeply affects the nervous system and our mental and emotional blocks. [16:02] Hypnosis impacts the neural pathway, rewires our conditioning, and helps bring in shifts from the subconscious mind to the present moment to manifest our reality. Lynsi graciously created a bonus hypnofertility session just for you that wasn't part of our interview. Have a listen or download for later. [28:20] We talk about the spiritual side of fertility and a good exercise in how we experience the spiritual realm. [30:22] Whether it’s an Indigo, Rainbow, or Crystal child, they all need structure and parental involvement. We are both inspired by the work of Carolyn Myss in the world of spiritual upbringing on a physical plane. [39:45] Lynsi’s three keys to conception: meditate, listen, and trust. [50:42] As a parent herself, Lynsi establishes a strong parental role but also isn’t afraid to own her mistakes and apologize when something is her fault. There is an exchange of energy and lessons to be learned but they must have an environment of structure. [56:42] We explore hysteria, the uterus, and how it was treated in the past, vs. our present-day tendency to “sshhh” women into not expressing their emotions and trauma. 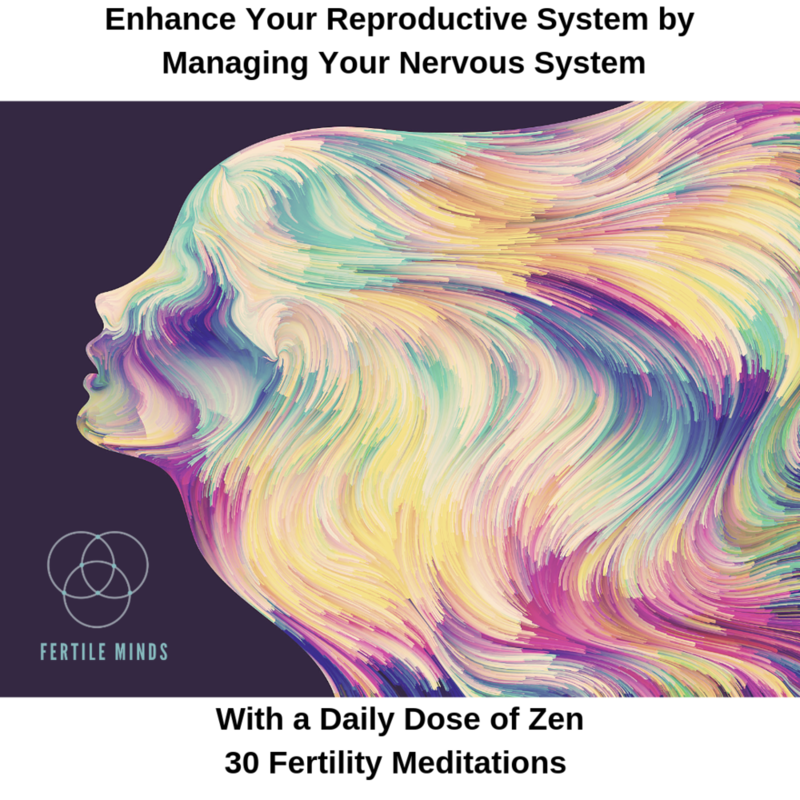 Take the Fertile Minds Meditation challenge and see what a fertile mind feels like. Each day you’ll receive access to a 15 minute guided meditation designed to yield more clarity and calm no matter wher you are on your path to building a family. Today’s Mindful Moment session invites you to float away from the everyday stresses and move towards what makes you feel good. Our guided meditation doesn’t use a mantra or breath, just our imagination to teleport you to a place that we associate with comfort and relaxation. This is perfect for yourself and possibly your partner as well, and a great way to start your morning practice or before going to a doctor’s appointment. [0:33] Today’s episode is brought to you by my 29-Day Meditation Challenge, starting April 29, 2018. [1:17] Managing and lowering stress is extremely important in everyday life, especially in cases of fertility and conception. For example, a study in 1993 by Domar pointed out that distress scores of depression and anxiety were similar to those engaged in cancer treatment and MORE than those recovering from a heart attack. [2:15] I suggest the images rather than give them to you because what we all find relaxing is subjective and it is up to you to feel in control and calm. The more you practice this guided meditation, the more you access this during stressful or trying times. [4:14] The guided relaxation begins. Please find a comfortable place to lie down or sit where you are away from distractions. [16:43] Guided relaxation comes to an end. Know that this is an exercise you can come back to time and time again when you need some relaxation and clarity in your life. Today’s mindful moments episode is all about setting your morning right with a quiet continuous breathing meditation. Whether you have 30 seconds or 30 minutes a morning, this will help get you clued into your own body every morning, and set you throughout your day with more positive self-talk and intention. I recommend this meditation both before and after you take your basal body temperature. Nothing fancy, just quiet continuous breathing and some visualization to start your day out with a connection to yourself and your calmest potential. To share your own fertility story, please email me at hillary@ladypotions.com. I look forward to connecting with you, as you are what this podcast is all about. [1:11] Today's Mindful Moments Meditation focuses on the quiet and continuous breath. [2:31] Watching bad news early in the day had long-lasting effects and set the tone for a negative day. Shawn Achor and his wife Michelle Gielan, as originally reported in Harvard Business Review, found when you’re exposed to just three minutes of negative news first thing in the morning, you have a 27 percent higher likelihood of reporting that you had a bad day six to eight hours later, compared to a group exposed to positive, solutions-focused news. [4:18] If you like these meditations and want to sign up for my free 29-day meditation challenge I’ll be offering in April, go to the show notes click here and click the link to sign up so you’ll know as soon as it is live. If you are listening to this past April 2018 you can still click the link and you'll be able to purchase the challenge to do on your own. [6:09] The key is to pay attention and observe the breath. This meditation does 4 x 4 breaths, with observing on the inhale and exhale. This is a technique that I just practiced with my teacher davidji and I absolutely love. I have a hard time following my breath, but this practice had me in a trance in a matter of minutes. [9:02] It is recommended to do this meditation, take your basal body temperature and then practice the meditation again. Even as little as 5 minutes can be key to setting the tone for the day. [10:45] You will hear a bell at the 5, 10, 15 and 20-minute mark. This will remind us to gently move our focus back on the breath. [11:21] Meditation begins and offers a sweet spot of quiet and quickness. [35:59] Meditation ends and we focus on our physical surroundings and the peacefulness we cultivated. A meditation to provide more peace and joy along your fertility road trip. Description: Feelings of loneliness, fear, and doubt are universal to a woman during her fertility road trip. It is common to feel hopeful and confident one moment and then isolated and frazzled the next. Today’s mindful moment episode will be all about restoring more peace and joy into your space, and to remind you that we are all connected and can send healing energy and love to one another, especially during a time such as implantation. We will dive deep in a meditation that came out organically as I was working with a lovely woman on her our experience. Today’s meditation will help you connect to your heart, let go of attachment, and breathe in faith and gratitude. To share your own fertility story, please email me at hillary@ladypotions.com. I look forward to connecting with you, as you are what this podcast is all about. [1:53] The difference between a positive and negative stress experience is the beholder’s perception of time. [2:35] This episode is dedicated to Lindsey, who inspired Hillary as she is brave and inspiring along her fertility road trip. This meditation that came out organically as they were working together and Hillary recommends this as a useful tool for relaxation during the implantation process. Practicing the habit of developing an attitude of gratitude. Description: I am very thankful for the ability to share today’s episode with you. Creation of life is INTERNAL and it needs a relaxed state to begin, which is exactly why a gratitude practice can help. I invite you to see what unfolds when you commit to an attitude of gratitude. We talk about why it is a matter of health to call on positive emotions, how to start the process of being grateful, and why it’s important to stop waiting until things “are better.” I guide you through a meditation for gratitude to take with you on your day and ongoing journey with fertility. [1:30] Oftentimes I’m asked, “What is the quickest way to get healthy or get pregnant?” My answer is simple. “Start focusing on the good things in your life. Take stock of what is benefiting you (people, behaviors, habits, environments) and lean into those areas of your life. Place less emphasis on what you don’t have or what is irritating you, especially if it is a physical symptom or the lack of a child. [2:02] When the body is in a state of homeostasis or balance it wants to create life. [5:06] It’s actually a matter of health to learn to call on positive emotions like gratitude when we are feeling challenged, fearful, or untrusting. Creation of life is INTERNAL and it needs a relaxed state to begin which is exactly why a gratitude practice can help. [7:30] The idea here is just like our meditations; there is no right or wrong way to do it. Make it your way so it will stick and you’ll want to do it and before you know it it will become part of you! [8:11] In order to start believing or recognizing miracles it begins with the process of being grateful for what is right in front of us, especially the little things AND the things we might think of at first blush as not so great. [11:07] The meditation for gratitude begins. If you need to come back to this meditation, text TURKEY DAY to 44222. A digital copy of the meditation portion of this series will be emailed to you so you can play it anytime, anyplace, when you’re ready. We are in interesting times. Everywhere you turn there seem to be intense emotions and angry accusations flying. From the #metoo to righteous anger over recent violent events, I thought it was a good time to record an antidote to all of this anger. Today we will be focusing on the skill of forgiveness. It's a skill that needs to be practiced in order to make it a permanent part of ourselves & anyone who's been trying to conceive can attest to the myriad of ways the Universe is presenting them with an opportunity to learn to forgive yourself and others. [:57] Anger is a powerful emotion and one that can cause great harm or tremendous growth. It's completely up to us how we choose to use it in our lives. And I say use it because it can create great movement in our lives and a fertility journey. Finally letting ourselves off the hook for something we did when we were 20, forgiving our partner if they have some sort of block to having a child whether that’s mental or physical, or forgiving ourselves for something we did or said, especially if when hormonally hijacked on something like Clomid can be key to opening up space within ourselves. [1:15] Remaining angry with someone is like drinking poison and expecting the other person to die. Imagine what it does when the person you are angry with is you! Refusing to acknowledge our anger with ourselves or someone else can cause great harm on all three levels — physically, emotionally, and mentally. From a TCM perspective, we actually diagnose a type of depression that is the result of anger and frustration being turned inwards and pushed down until it eventually eats up all of a person's joy and turns into a smoldering depression. Sometimes I see this as a major cause of unexplained infertility. [2:23] So what is the solution? First, identify what you are actually angry about, who you are angry at, and what part you played in the situation. After we identify it, we accept it as something that happened in the past or a past version of ourselves if we are to blame and then we commit to continue to release it as many times as it takes until we reach a state of complete forgiveness for everyone involved. This takes great patience and commitment but it’s the greatest gift we can give ourselves. [3:20] Forgiveness is never for the other person. It's always for ourselves. It's letting go of something that is causing us great pain and it takes incredible strength and repetition to continue to forgiveness. One must not confuse this with weakness or with letting the other person or ourselves off of the hook. [3:58] When you find you are having trouble forgiving, remember we are all human. And just as you’re not the culmination of one thing or one action or mistake, neither is someone else. [4:04] In today's meditation we will be quietly asking ourselves some questions so we can zero in on where we carry the anger or frustration in our body and we will use a mantra to help release the bodily feeling or the obsessive thoughts that sometimes occur with anger. According to Ram Das in Buddhism mantra means “mind protecting.” A mantra protects the mind by preventing it from going into its usual mechanical habits, which often are not our optimal conscious perspective. [4:50] Mantras can be super helpful when we are feeling consumed by a feeling or replaying someone's word or a situation in our head. Not only can you use this as the mantra during sitting meditation, but you can use it in your waking day when you become aware that your thoughts have drifted back into replay mode. When you become aware this is happening, simply repeat the mantra to yourself several times until you feel some space or peace open up inside of you. [5:54] Today we will be using a mantra heralding the archetype of the Green Tara. In the Mahayana Buddhist tradition, it is believed that she is a Bodhisatta, or a Buddha, who has chosen to stay accessible to humans to help relieve their suffering. She is said to awaken our wisdom so we see the truth of our reality and to heighten the compassion of the person repeating her mantra or focusing on her figure. [6:22] Buddhists say her qualities are accessible to anyone regardless of religion or creed, so fear not if aren't Buddhist, it can still be a strong practice. However, If you have a strong Christian background and this makes you uncomfortable I wish to stress that this isn't worshiping false Gods, rather it is asking to have the same qualities the figure was known to embody. [7:27] The Sanskrit mantra we will be using is a bit of tongue twister, "Om Tare Tu Tare Ture Swaha" but that's okay because it will act as a magnet of concentration. Sanskrit mantras are interesting because they are based on seed syllables or Bija mantras, that set up vibrations fields though sound. They work even when recited silently, reverberating within. [23:28] Anytime in your waking day if you sense anger, or frustration, silently to yourself use the mantra to help release it as you remember your commitment to forgive for the sake of yourself. [24:01] POEM from Prayers of Honoring, by Pixie Lighthorse. If you wish to download this meditation and have it for your fingertips free of the intro to this episode, simply text Forgiveness to 44222.